Amid Climate Change, FEMA And Government Aid Widen Wealth Inequality The federal government spends billions of dollars each year helping communities rebuild after disasters and to prevent future damage. But that money isn't always allocated to those who need it most. 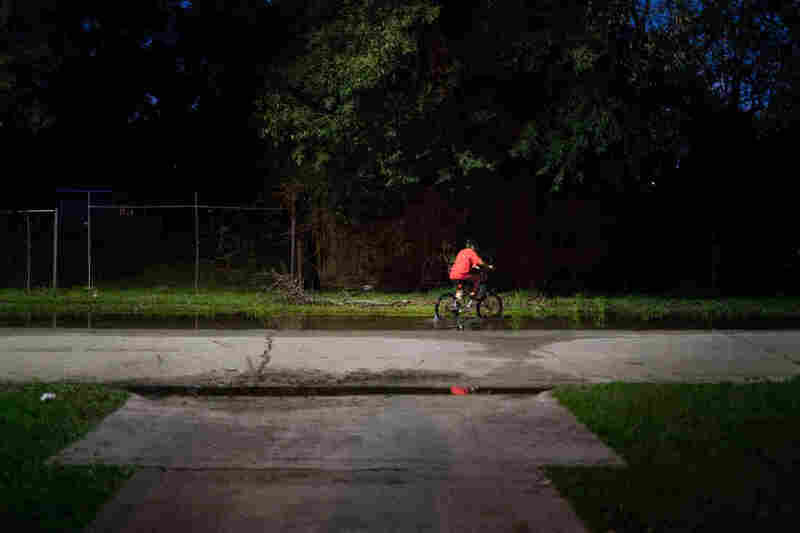 A boy rides his bike through still water after a thunderstorm in the Lakewood area of East Houston, which flooded during Hurricane Harvey. If they had known, they never would have bought the house on Bayou Glen Road. Sure, it was a beautiful lot, tucked in a bend of the creek, backyard woodsy and wild, the neighbors friendly and the street quiet. A little piece of nature just 20 minutes from downtown Houston. It was exactly what John and Heather Papadopoulos — recently married, hoping to start a family — were looking for in 2007. They didn't think much about the creek that ran along their yard, aside from appreciating the birds it attracted to the neighborhood. Across town, the Evans family was similarly indifferent to the wooded bayous that cut through their neighborhood. 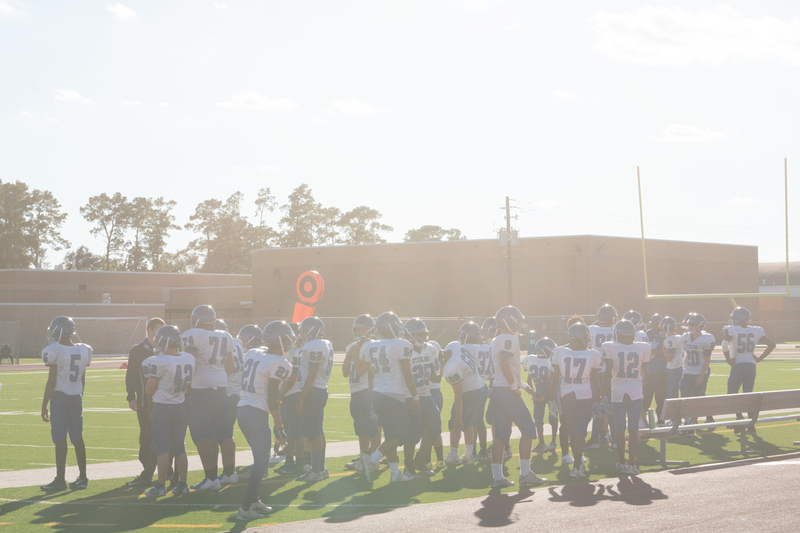 Janice Perry-Evans chose the house she rented because it was conveniently located near the local high school, which made it easy for her two boys to get to class and home from football practice. Her commute to the post office wasn't far either. Plus, at $800 per month, the rent was affordable. By 2017, the family had lived there for four years, and didn't have any plans to move. And then, in August of that year, both homes were destroyed. Both families had to start over from nothing. But today, one family is financially stable. The other is facing bankruptcy. John Papadopoulos stands in the rental home in Houston where he and his family moved after their house flooded. The taxidermied deer are among the few items they were able to rescue from their flooded home. Nowhere are the economic and racial inequities of disaster aid more apparent than in communities that have experienced one of the most costly and widespread disasters: urban flooding. Houston is arguably ground zero for urban flooding — a sprawling city built on low and marshy flatlands exposed to hurricanes blowing in from the Gulf of Mexico. 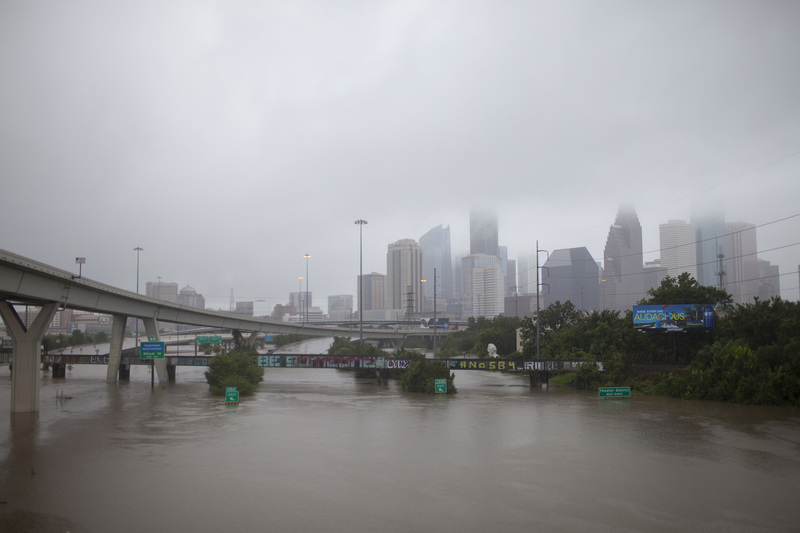 In the past decade, there have been five major floods in the city, culminating in the largest amount of rain ever recorded from a single storm: Hurricane Harvey in August 2017. The Papadopoulos and Evans families were two of the hundreds of thousands of families who evacuated their homes during the storm. After Hurricane Harvey hit the Texas coast in August 2017, the storm stalled over Houston and dumped as much as 60 inches of rain on some parts of the region. "We were the first ones to evacuate out of our house, up the street," remembers John Papadopoulos. In the years before the hurricane, their home had gone from a refuge to a nightmare. It flooded in 2009, in 2015 and in 2016. By 2017, they knew what to do: Put the valuables up high, and get out. They went to a neighbor's house first, and then to a hotel. It was a new experience for the Evans family. "When the water started coming up, we thought we were going to have to go on the roof," says Janice Perry-Evans. "But we ended up not going on the roof. We ended up, me and the kids, packing up a little bit of stuff" in a plastic container. "We got out and we walked in that water," she remembers. The water was up to her armpits in places. Eventually, a dump truck carried them to a bus, and the bus dropped them at the convention center downtown. 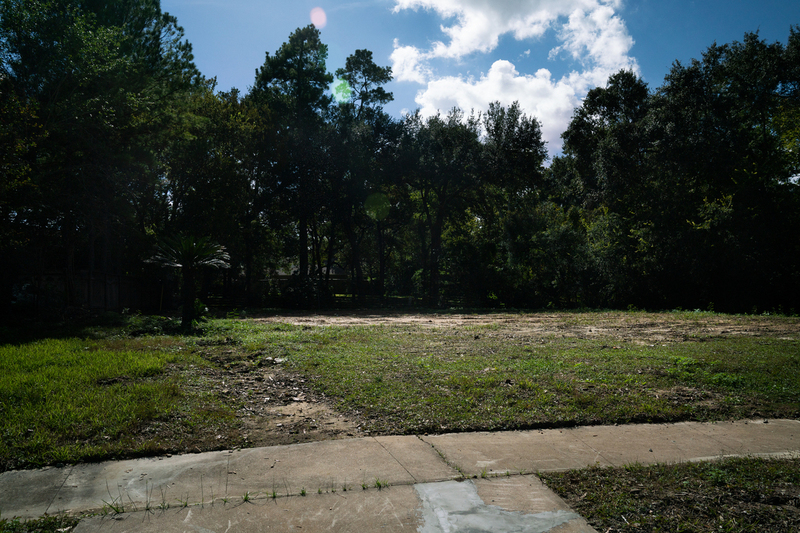 The empty lot of land where John and Heather Papadopoulos' home once stood on Bayou Glen Road. 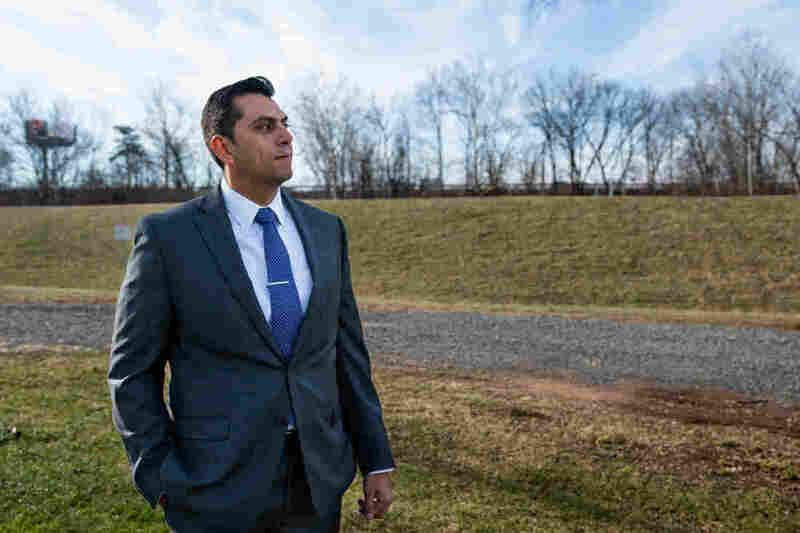 The next morning, Perry-Evans and Papadopoulos took the same first step to start rebuilding their lives — they turned to the federal government for help. But almost immediately, their experiences diverged. From the beginning, a lot of things went right for the Papadopoulos family. 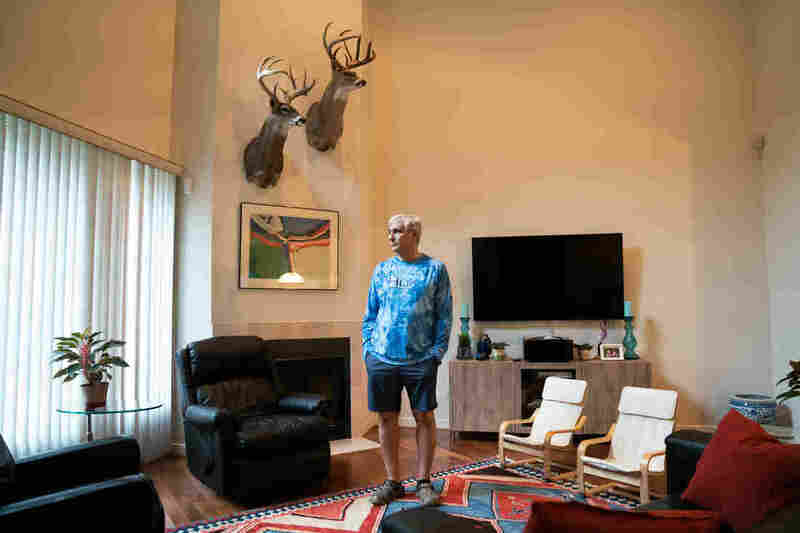 John's employer, Microsoft, gave him as much time off as he needed and more than $10,000 to help with rent and other bills that piled up after the flood. The Papadopouloses rented a townhouse nearby and, within a few months, the federal aid they had applied for began to arrive. The Federal Emergency Management Agency gave them $30,000; because the family owned a home that had been destroyed in the flood, the Internal Revenue Service sent checks for more than $100,000 in refunded taxes — a perk of having a relatively high income. The Small Business Administration gave the family a low-interest loan. About a year after the storm, Papadopoulos said, his family was financially stable. The Evans family was not. Janice Perry-Evans' rental home flooded during Hurricane Harvey. She and her three children packed up a few things and waded through the water to get out. Janice Perry-Evans had one goal after the floodwaters receded: find a place to stay. She didn't have any savings for a hotel or a new apartment, so when a co-worker offered her a room in his house, she took it, even though it was one room for her and her three kids and it was a 45-minute drive from work and school. Then, she started applying for help from FEMA. The agency gave her about $2,500, enough to cover a deposit and first month's rent in a new place, but Perry-Evans needed the money for something else. Her oldest son was hoping for a college football scholarship. 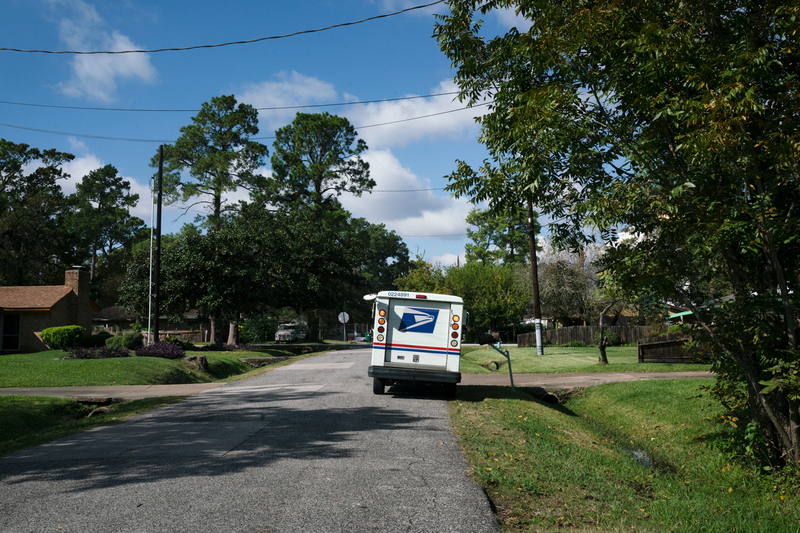 He couldn't afford to miss school or football practice that fall, and the family couldn't afford for Perry-Evans to miss shifts as a mail carrier for the post office. "I had to go to work, and I had to get these boys back and forth to school. So I took that [money] and I put it for a car," she explains. 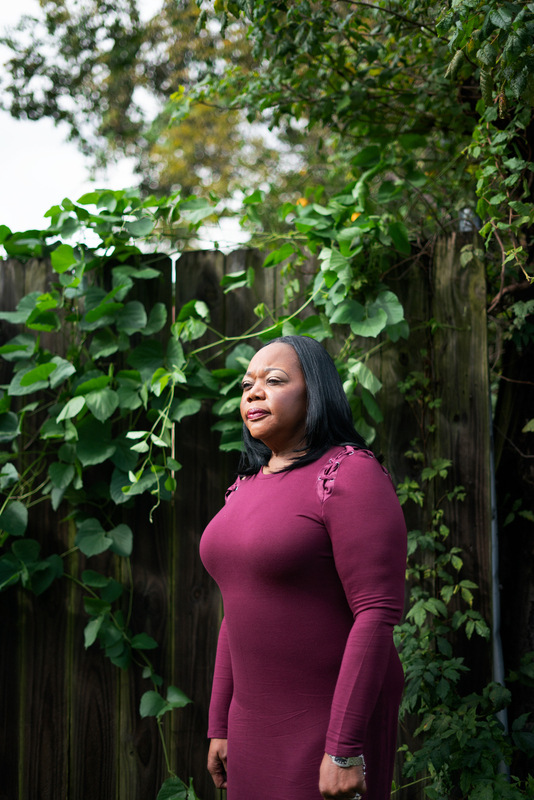 With her immediate transportation needs met, Perry-Evans went back to FEMA to see about getting more money for housing, but she says agency representatives reprimanded her for incorrectly using the money she had been given. "Some of them were kind of rude," she remembers. "Some of them felt sorry for me because I would be crying, [saying] 'Hey, I have nowhere to go. I don't have no money. You guys are not helping me like I thought.' "
FEMA didn't block Perry-Evans from reapplying for housing money, but she says after the scolding she turned to other potential sources of federal aid, unsuccessfully. Her income wasn't high enough to claim a significant tax refund. She says she was denied a low-interest loan from the Small Business Administration because her credit score was too low. A FEMA representative suggested she try to get housing money from the Department of Housing and Urban Development, but after she used her day off to go to an information session, she was informed that her income was too high to qualify. Perry-Evans never missed a day of work as a mail carrier for the USPS in the months she spent applying for disaster funds. "It was like every time I tried something, it was an obstacle in the way," she says. The entire time, Perry-Evans says, she never missed a shift at the post office. She even worked the week that Hurricane Harvey hit Houston. She often worked six days a week. But her paycheck just wasn't enough to cover all her bills, and her co-worker said it was time for the family to move out of the spare room. Six months after the flood, Perry-Evans did the only thing she felt she could: She signed a lease to rent a house that cost 50 percent more than where they used to live, for less space. The electricity didn't always work. For more than a year after the flood, Perry-Evans was still sleeping on a cot she took from the convention center. Perry-Evans is not alone in her struggle. 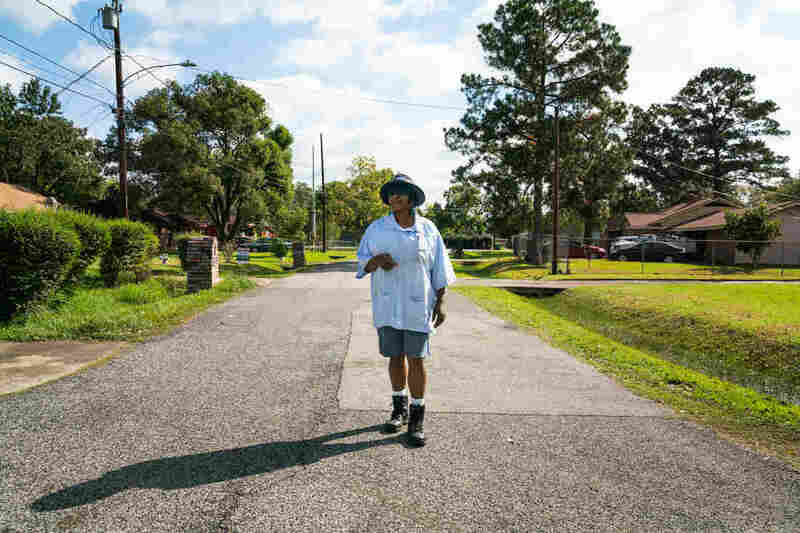 "Recovery for vulnerable families [looks] a lot different than it does for more affluent neighborhoods," says Kathy Payton, the director of the Fifth Ward Community Redevelopment Corp., a neighborhood nonprofit that works a few miles from where Perry-Evans lives. Kathy Payton is the director of the Fifth Ward Community Redevelopment Corp., a neighborhood nonprofit in Houston. Payton grew up in Houston and has spent decades supporting the basic needs of her neighbors, many of whom live on fixed incomes or do not have a cushion of savings to fall back on after a disaster. "We had loss of income because people lost their jobs. We had increased health issues as a result of them living in bad situations," she says, ticking off the cascade of challenges lower-income families have contended with since the flood. Many families struggle to successfully apply for money because they do not have access to a computer, she says, or do not have all the paperwork they need, or can't take time off from work to meet with a FEMA representative. Payton says wealthier families are more able to comply with the rigid application requirements. "There shouldn't be a cookie-cutter, one-size-fits-all template," she says. "You've got to make adjustments based on the vulnerabilities and the needs of the families. And that's not what we do." Those application requirements are not explicitly designed to favor some citizens over others. Under the 1988 federal disaster relief law, the requirements exist to protect taxpayers from fraudulent or improper payouts after a storm, by keeping track of who has been given money for what. But Payton says the upshot in Houston is that the more affluent parts of the city have recovered more quickly and deeply since the flood. Private insurance accounts for some of that, but Payton also believes residents in those areas have been more successful at getting federal money. "Those families who are more apt to be able to respond to that [funding] will do so quickly, will do so more efficiently and the funds will be available on a first come, first serve basis," she says. Families who cannot, she says, "will be left behind again." A new and growing body of research backs up Payton's observations. Studies by sociologists, as well as climate scientists, urban planners and economists, suggest that disasters, and the federal aid that follows, disproportionately benefit wealthier Americans. The same is also true along racial lines, with white communities benefiting disproportionately. Football players gather at C.E. King High School. Perry-Evans' younger son is on the team. After the family was displaced by the flood, Perry-Evans needed to use the $2,500 she had received from FEMA for a car because they were living more than 45 minutes away. "Cities are often very unequal to begin with," says James Elliott, a sociologist at Rice University. "They're segregated and there are lots of income disparities, but what seems to happen after natural hazards hit is these things become exacerbated." "We see these same patterns of wealth inequality being exacerbated in communities that receive more FEMA aid," explains sociologist Junia Howell of the University of Pittsburgh. Howell and Elliott have published multiple studies that find a pattern in who wins and who loses after floods and other disasters: Rich people get richer after a storm, and poor people get poorer. "That's particularly true along racial lines, along lines of education, as well as homeownership versus renting," explains Howell. And rather than mitigating the inequity, federal aid exacerbates it, in part because of the biases Payton has noticed that are baked into how federal money is distributed. NPR examined one federal disaster program and found evidence of exactly that phenomenon. The program uses federal and local money to purchase homes that have flooded or been affected by other natural disasters and permanently turn the lots into green space to reduce flood risk. The buyouts are voluntary, and the homeowner can use the money to move to a safer place. As climate change drives more extreme rain, David Maurstad of FEMA says he expects the program to grow more in the coming years. 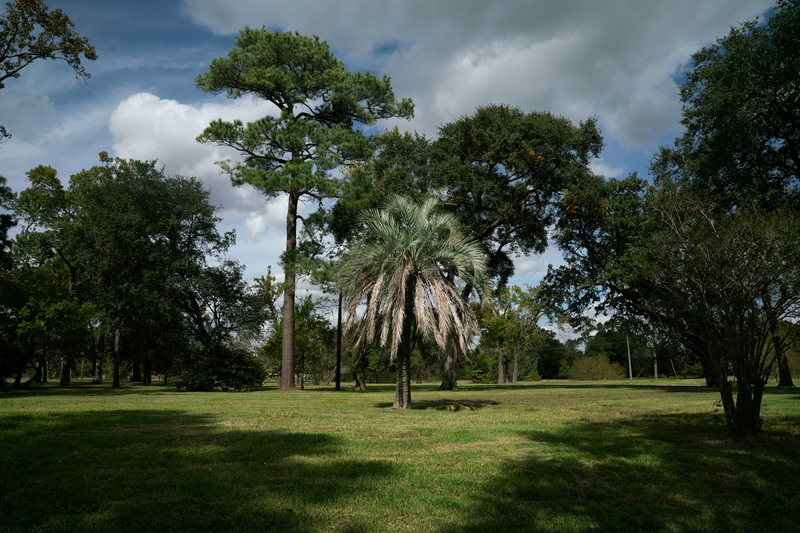 An ornamental palm tree stands in an empty field where there were once houses in Houston. As climate change drives more extreme rain, FEMA says it expects demand for the program to grow in the coming years. Hurricane Harvey in Houston was a cataclysmic event. But more extreme rainfall is falling all over the United States, and that means more flooding. The trend will continue in the coming years, and so will the need for disaster relief programs — and programs designed to mitigate damage. But even when those programs work as designed, NPR has found that inequality persists. More than 1,500 miles northeast of Houston, two towns show how disaster relief efforts are determined and who wins and who loses in the calculation. Manville, N.J., an hour outside Manhattan, has flooded repeatedly since the 1970s. On a recent tour, Superintendent of Schools Robert Beers drove over a bridge and into a neighborhood called Lost Valley, a suburban enclave of Cape Cod-style homes built in a compact grid along the Raritan River. "This area was hit the hardest," he says. "And as we drive through you're going to be able to see a lot of vacant homes, and areas that were bulldozed. Some of these open, these vacant lots here, there were homes here." 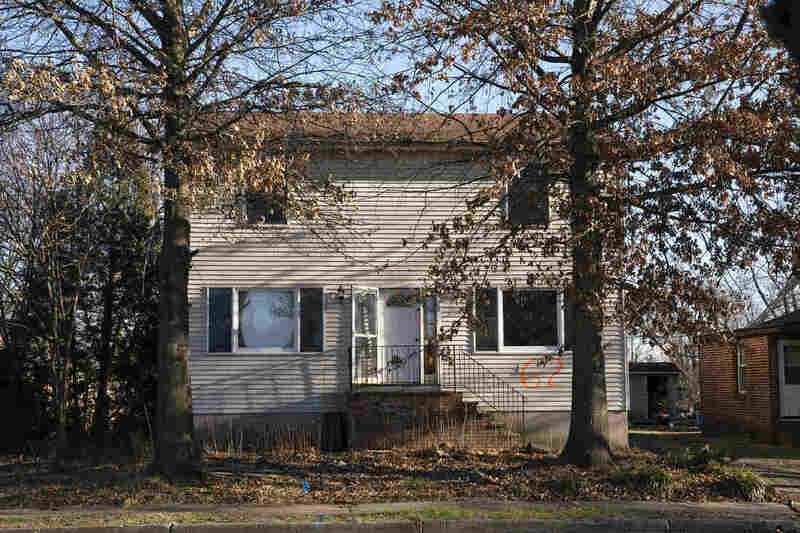 Over the past two decades about 150 homeowners in Manville have taken disaster buyouts, and 80 more abandoned their homes. A drop in household incomes followed, and home values lagged behind nearby towns. "After the first flood, people began thinking, 'Is it time to get out?' " says Eleanor Nieliwocki, who lived in Lost Valley for more than 30 years. "After the second flood, not again. And the third flood, we've had it." She finalized the sale of her house to a government buyout in 2015. "We've had to cut programs; class sizes have grown; and, quite frankly, we haven't been able to offer the supports that our students so desperately need," said Robert Beers, the superintendent of Manville School District. And buyouts like Nieliwocki's matter to Beers. All those vacant lots affect how much money his schools get. Fewer homes overall mean less tax revenue to fund education. Last year, Manville's public school system found itself battling large budget shortfalls. At the same time, Beers says, the schools faced new demands: Since 1999's Hurricane Floyd, Manville's Hispanic population had risen from 5 percent to 23 percent. And even though the buyouts in Manville hurt the tax base, FEMA says the strategy actually saves money in the long run. The agency says for every dollar spent on buyouts and other hazard mitigation programs, federal taxpayers save $6 in future disaster losses. The agency has allocated more than $15 billion on those strategies since 1989. 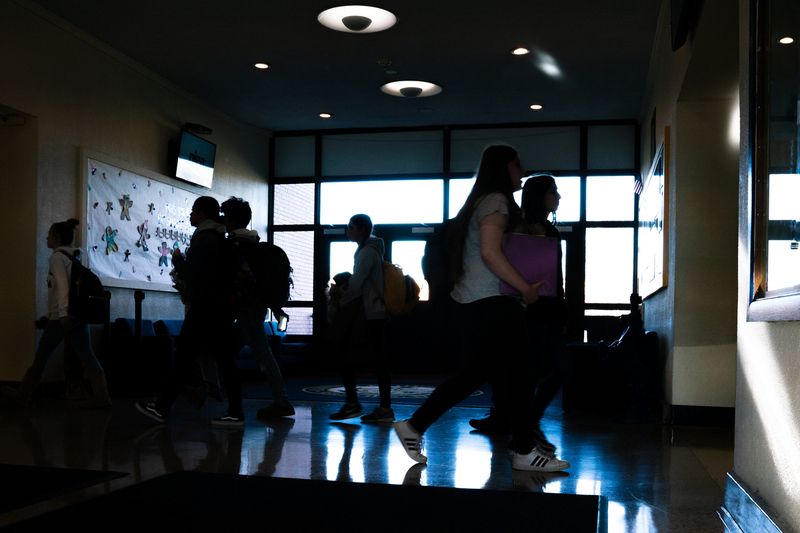 Students walk through the hallways of Manville High School between class periods. Fewer homes have meant fewer tax dollars to fund education, and the public school system has found itself battling large budget shortfalls. "I think our program is achieving in Manville what it's intended to achieve," says Maurstad, who oversees FEMA's buyout program. He says FEMA is meeting its goals if it makes a community less risky, saves property and potentially saves lives. 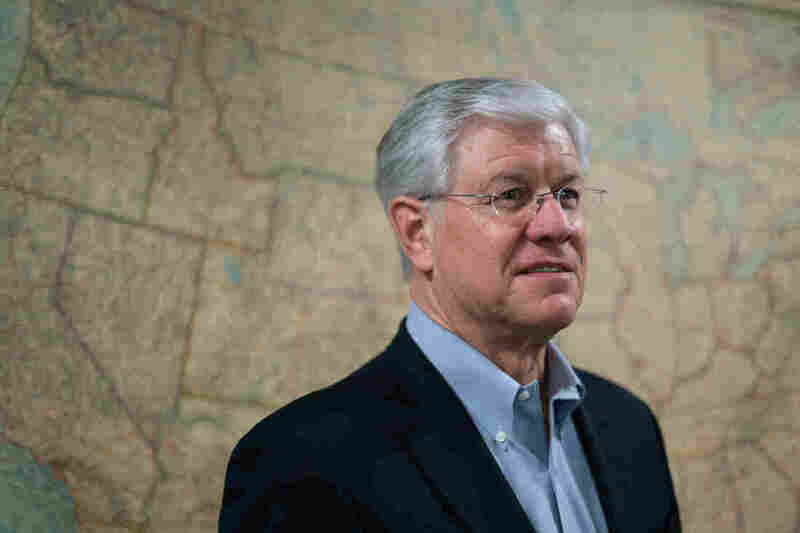 And he points out that while FEMA pays 75 percent of the cost to buy out homes in disaster-prone areas, states and localities decide where they want those buyouts to occur, so demographic changes aren't on the federal agency's radar. "I'm not aware that there's been a specific study by FEMA or anyone else on the demographic distribution of [the buyout] approach," says Maurstad. "But the approach itself is not one that would necessarily, intentionally lead to those outcomes." FEMA's David Maurstad, who oversees the buyout program, points out that while the agency pays 75 percent of the cost to buy out homes in disaster-prone areas, states and localities decide where they want those buyouts to occur, so demographic changes aren't on the federal agency's radar. Reeling from repeated floods, Manville asked the Army Corps of Engineers to build a flood control system to protect it. In 2016, the Corps said no. Catherine Kling, an economist at Cornell University, studies the kind of benefit-cost analysis the Corps does to decide which property is worth saving. "The whole idea of a benefit-cost analysis is actually very simple," Kling says. "It simply seeks to answer the question: If we do this project, is the total value from this project greater than the total costs?" That means that protecting 10 families in $1 million houses has the same value as protecting 100 families in $100,000 houses. In Manville, the Corps counted about 500 homes and businesses in flood zones and said it could protect them for about $67 million. But for every dollar spent on the project, only 40 cents' worth of property would be saved. Under federal guidelines, that's not enough. "It is completely agnostic as to who receives those benefits and those costs," says Kling. And, she says, economists assume the people displaced and the economic activity they generate will simply move somewhere else. 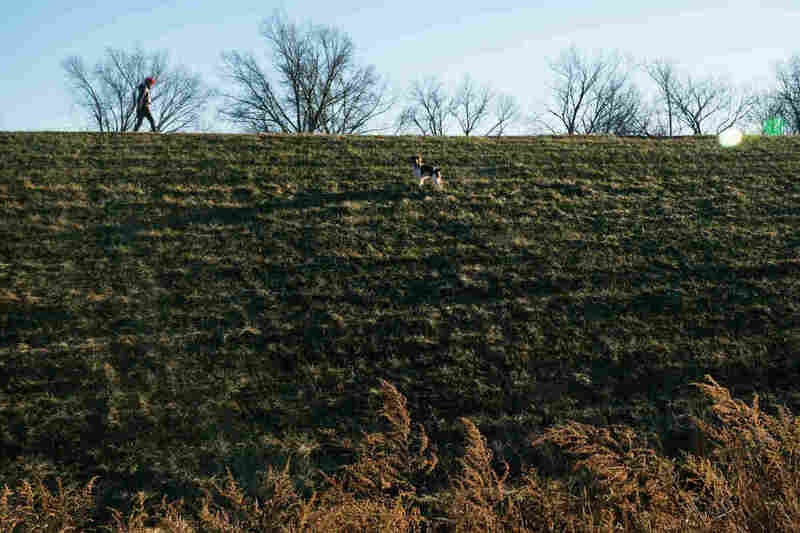 A woman walks her dog on the levee in Bound Brook, N.J. The town, which is just 4 miles from Manville, was awarded a $650 million flood control project. Still, even if the approach is designed to avoid picking winners and losers, it ends up doing so anyway, favoring wealthier neighborhoods. "It's also going to be [choosing] more valuable businesses," Kling says. "More valuable real estate." Indeed, if there were a climate change lottery with public funding as the prize, you could say Bound Brook, N.J., just 4 miles from Manville, hit the jackpot: a sweeping, $650 million flood control project whose local portion was completed in 2016. Developers followed, investing tens of millions of dollars. 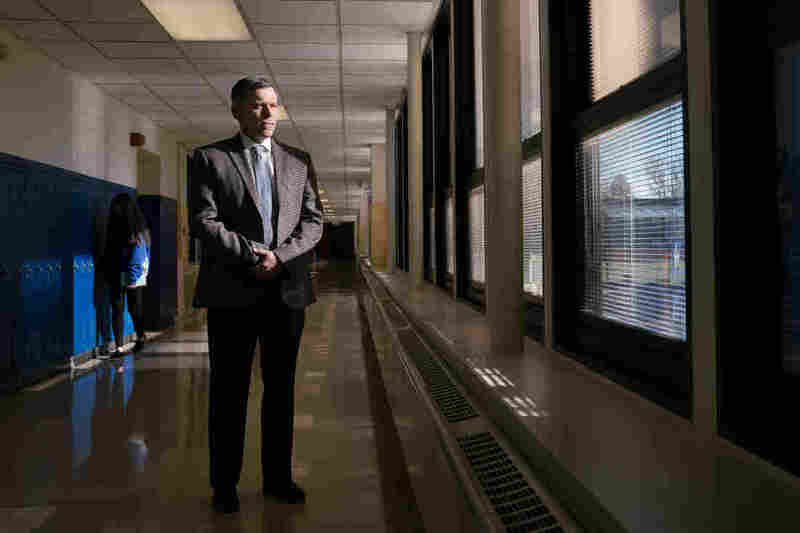 In Bound Brook, on a very different tour around town last summer, Councilman Abel Gomez detailed plans for hundreds of upscale apartments, new restaurants and an expanded Main Street. "Without flood control," he said, "you were always the next natural disaster before you were wiped out." Town Councilman Abel Gomez stands near a levee in Bound Brook. "Without flood control," he said, "you were always the next natural disaster before you were wiped out." But some residents worry how they will afford to live there once the new projects are completed. Bound Brook has one of the nation's largest concentrations of Costa Ricans — enough that the country's president visited in 2014 — and a history of alleged housing discrimination. The Justice Department sued the town in 2004, saying its housing policies discriminated against Latinos, and for years its housing and development practices were regulated by a consent decree. In 2017, a local government analysis found that households in the most heavily Latino neighborhoods had lower incomes and spent a greater portion of their incomes on housing than those in the majority-white area. Some of the newer apartments are already renting for hundreds more than the town's median rent. Francisco Morales Mora, who emigrated from Costa Rica in 1994 and owns a restaurant downtown, says that's too much. "The people of Bound Brook are poor," he says. "And unless the new [apartments] are cheaper, people will leave." 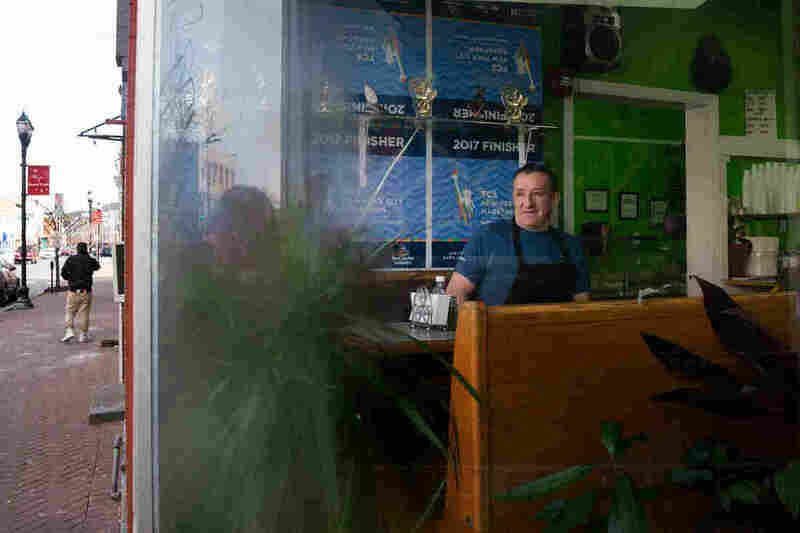 Francisco Morales Mora, a Costa Rican immigrant, owns a restaurant called Frank's in downtown Bound Brook. Morales says more development in town, fueled by feelings of relative safety from floods, will be good for business and make the town more vibrant. But he worries about affordability. Robert Greco, the project's manager for the Corps, says the flood control project in and around Bound Brook protects a highly dense area with a range of income levels. He says it isn't intended to favor the wealthy but acknowledges that the project is changing the area. "The Borough of Bound Brook is not wealthy," Greco says. "But guess what, now they're building and the economic vitality is picking up, and it's beautiful, actually." Pressed on what the new, expensive development plan might mean for the Latino community, Gomez, the councilman, says, "We really, really hope that the Latino identity that's here remains here. ... Because that's key to this. It sets us apart." One part of the flood wall that connects to a closure gate on East Street in Bound Brook that keeps floodwaters out of downtown. The bigger picture around the country is that some Americans will be more vulnerable and some will be more resilient in the face of climate change. And who wins and who loses appears to mirror existing inequalities. "Hardworking Americans who are working class are going to find their communities stressed even more than they are now," says Andrew Light, an editor of the 2018 National Climate Assessment. "If you're already a community at risk, you're going to be at more risk." In Houston, the Papadopouloses have applied for a buyout and are likely to be offered one if they wait long enough. It may take years. Janice Perry-Evans and her family are still in their rental but, "It is really a struggle now to stay afloat," she says. She plans to file for bankruptcy. And in Manville, even as the Army Corps of Engineers declined to build a flood control project, it predicted that "significant flooding can result in municipal infrastructure damage, loss of jobs, and closure of businesses," as well as "continued potential for loss of life." 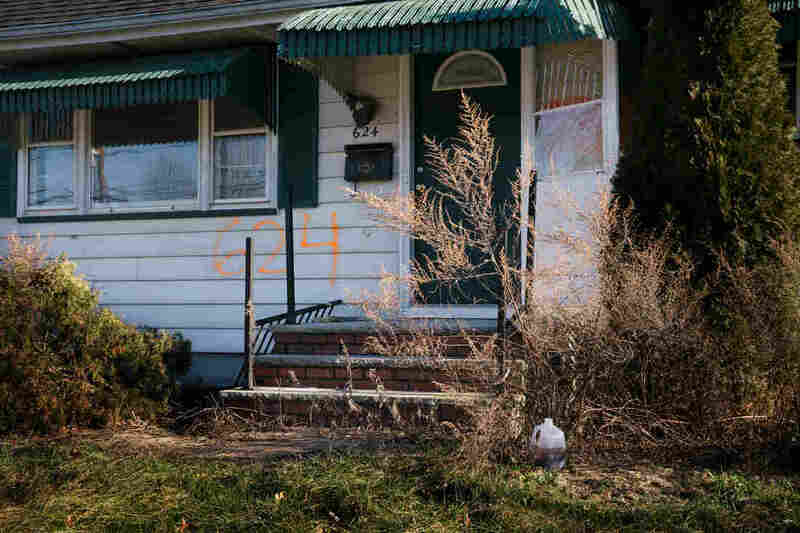 Over the past two decades about 150 homeowners in Manville have taken disaster buyouts, and 80 more abandoned their homes. This house in Lost Valley was bought out. NPR's Meg Anderson and Barbara Van Woerkom contributed to this story.